I recently attended SaaStock 2017 and it was absolutely phenomenal. Hands down the best conference I have been to due to the excellent speakers, the super smart attendees, and the wonderful atmosphere and events the organising team put together over the course of three days in Dublin. It was so easy to meet new people, no one was overly selling anything, and everyone was there to learn, share and discuss the highlights and challenges of growing a successful SaaS business. I’ve now had some time to come back to my notes and reflect on the all the presentations, discussions and learnings from SaaStock to understand how they can impact the way I work. With that in mind I felt it would be beneficial to document my findings and share them with you here on The Growth Hub. Please note that I was not able to attend all the sessions and there were many excellent presentations that are not referenced on this list, but I wanted to share those that had the biggest impact for me as SaaS marketer at Advance B2B. Content marketing is a big challenge for all companies, not just those in SaaS. Fortunately Ed opened up on his content journey at Berlin-based ChartMogul and how they built an engaged audience over the last couple of years. He talked about what it takes to become a thought leader, the importance of metrics in content marketing, and why you need to focus your efforts on the long term through evergreen compounding content rather than looking for those quick wins or cheap content hacks. But perhaps the biggest takeaway came at the end of his talk about the purpose of your content. It can be easy to fall into the trap of creating content for the sake of creating content and sometimes companies don’t fully appreciate the role it plays in their overall growth. Simply put, Ed stated that “the purpose of your content should be exactly the same as the purpose of your SaaS business.” Never have I heard such a concise, accurate and perfect definition of the role of content marketing. The second point resonated extremely strongly with me since SaaS companies can be too eager to scale once they’ve found product-market fit. Rather, companies must first find a profitable growth model that is repeatable and scalable before they invest in actually scaling up. A key sign that a SaaS company has found this is when Bookings = Net New ARR (New ARR + Expansion ARR - Churned ARR). Action >> Critically view everything from the perspective of the ideal customer and optimise each step of the funnel to the thoughts and reactions of each buyer persona. We love tools. The average SaaStock attendee was using 12 of them and we love to have tool turf wars. Marketers have their stack for marketing ops. Sales have their stack for sales ops. And customer success have their stack for success ops. All these tools and all this decentralised data leads to the so called Frankenstack when instead we should be building a customer stack for customer ops. Action point >> Think how we can reuse all our data pieces, which are like Lego blocks, to build a more personalised customer lifecycle. I also spoke with Ed about this on The Growth Hub Podcast so if you want to learn more about this then check it out! TapInfluence was an influencer marketing agency based in Colorado. That was until it became a SaaS company based in Silicon Valley. Promise Phelon joined the company as CEO where she led this comprehensive strategic transformation and turned a high touch agency into a data- and tech-driven SaaS platform growing gross revenue 400% in just over two years. If i had to pick a favourite talk at SaaStock 2017 then this would be it. Promise’s story of how she turned TapInfluence from an agency into a SaaS business was as captivating as it was informative, not least when it came to identifying your customer. Promise highlighted that their ideal customer was about 180° off from what they thought in 2015 and that “you’re always actively looking for your ideal customer, it’s not static.” Her no vampire rule (see slide 18) was also pretty good. Action point >> Return to buyer personas on a more regular basis to ensure we are aligned to the situation right now and not that of six months ago. For me, the key lesson from Hannah’s talk was not necessarily about saying no to funding or strategically bad ideas, but more so just about “saying no”. It can be very difficult to say no, but we must be disciplined in choosing where to prioritise and focus our precious energy and time. Much in the same way as Ed Shelley’s talk focused on content and its purpose being the same as that of your business, Hanna’s talk reinforced that we as marketers need to understand whether each and every activity we undertake is going to move the growth needle in the direction we need to take it. Action point >> Say no, more. Teamwork founder and CEO Peter Coppinger knows the value of brand. With the domain teamwork.com already taken, Peter contacted the owner to ask how much it would cost to buy. $20 million was the answer. After a few more back and forths, Peter was able to get the offer down to a more reasonable fee. “I paid $675 000 for the domain teamwork.com without telling my cofounders and that was all the money we had in the bank at that point.” Teamwork.com has grown its ARR to $18M, and all of a sudden that investment in the teamwork.com brand looks like it is going to provide incredible ROI. Action point >> Invest time and money in your brand. There is nothing more valuable. 7. "Sustainable growth comes from loops, not linear channels"
Growth is not linear, it is circular. This is something I never fully appreciated until Pedro spoke at SaaStock about Typeform’s growth journey over the last couple of years. Action point >> Stop wasting time searching for growth hacks and invest in building scalable growth loops. I also spoke with Pedro on The Growth Hub Podcast about Typeform’s growth story to double digit ARR. 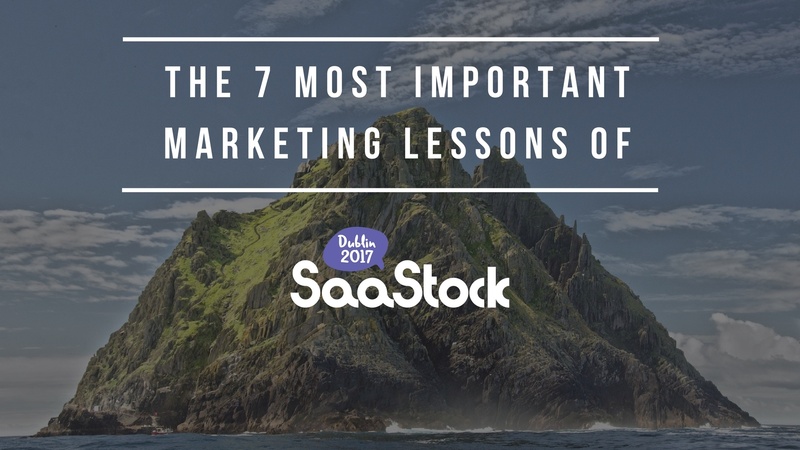 What were your biggest learnings and takeaways from SaaStock? I’d love to hear your thoughts! And if you'd like to chat with us about growing your SaaS business then just get in touch, we'd love to hear about what's working well for you, your challenges, and help you identify some growth opportunities.